The destinations for most of the fleet were pretty much the same. A very few were heading to Carrabelle, but most planned to anchor behind Dog Island and exit at East Pass later in the day for an overnight transit to Tarpon Springs and Dunedin. Beach House and four other boats headed to Alligator Harbor for the night with a dawn exit planned for a daytime run to the Steinhatchee River. The distance from Alligator Harbor is 10 miles shorter than from East Pass. By early afternoon, we were all settled in at anchor, and after dinner and a relaxing evening, the fleet was anxious to get underway at first light. The winds dropped off to calm conditions and the seas were perfectly smooth as the sun set in the west. So far, things were looking good. But we may have been a little overly optimistic. The forecast for Saturday was for east to northeast winds at five to 10. The crew was up at 5:30 a.m. waiting for first light near 7:00 a.m. The first clue should have been the increase in winds overnight. Our calm conditions were 10 to 12 by the time the sun came up. Still not too bad, so we had breakfast, secured the boat and hauled the anchor as soon as the sun peaked out from the east. 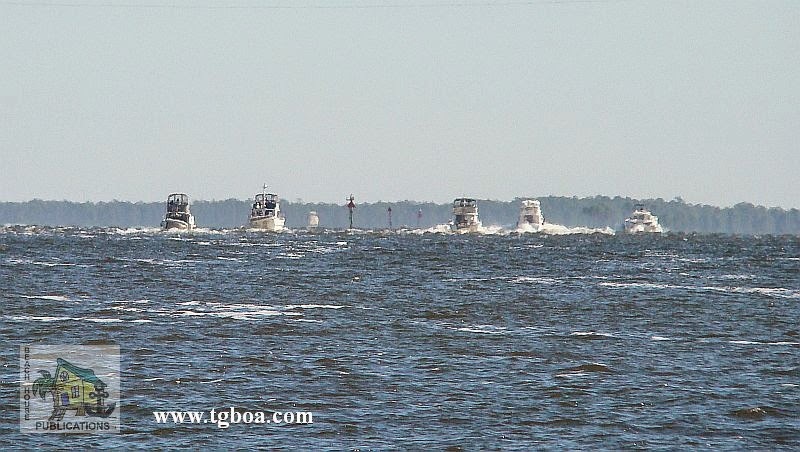 The other four boats also prepared to get underway, and Beach House led the way out of Alligator Harbor and toward the open Gulf. As we approached South Shoal, it became more and more apparent that once again we had been led astray by the NWS forecast. The forecast five to 10 winds were quickly reaching the 15-knot range. We were greeted with 3- to 4-foot seas instead of the forecast 1 to 2 feet, and wind and seas were directly on our bow. By the time we were 20 minutes out, waves were breaking over the bow every few seconds and the front windows were covered with saltwater. These were not the conditions we expected and not what we wanted to pound into for hours. As soon as we returned to more protected waters, the seas quieted down. The crew has no qualms about turning around if we decide we're not having fun. That's what this is all about and we had no place we had to be and no time to be there. We let the boats behind us know that we planned to turn around so they wouldn't be surprised, and Beach House did a 180. The other boats decided to press on. More power to them, and since some were much larger than we are, they could handle the seas a little more comfortably. Since we had left Apalachicola and bypassed Carrabelle, the plan was to head to C-Quarters Marina and wait until a new weather window opened for us. Carrabelle is about two and a half hours for us from Alligator Harbor. 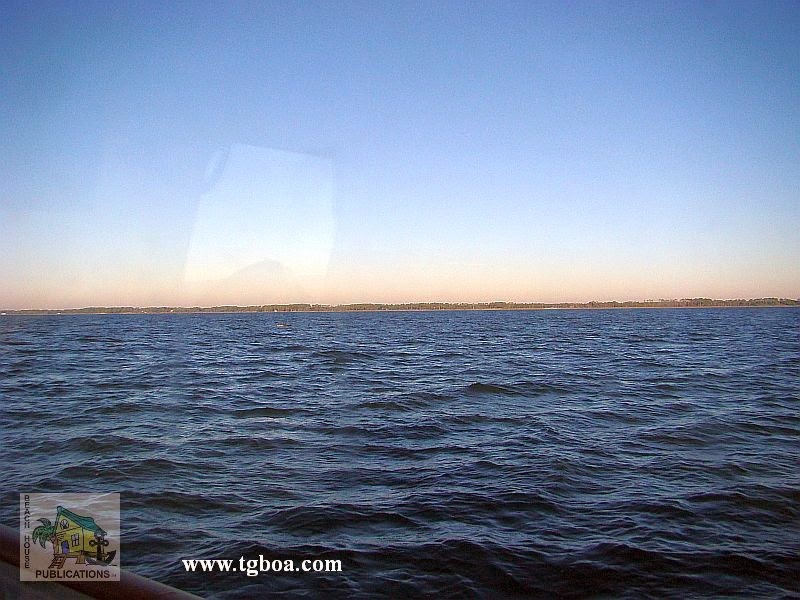 The river up to Carrabelle is deep, but the currents can be strong. This presents a problem when trying to dock in the slips at the marina. C-Quarters is a quaint, friendly place, but the docks were built long ago and not for larger pleasure craft. Most of their slips have very short finger piers that make getting off the boat from the bow very difficult if backing into the slip in the wind and current isn't possible. Fortunately, the current was light and Beach House was able to back into the slip on our single engine without bow thrusters. 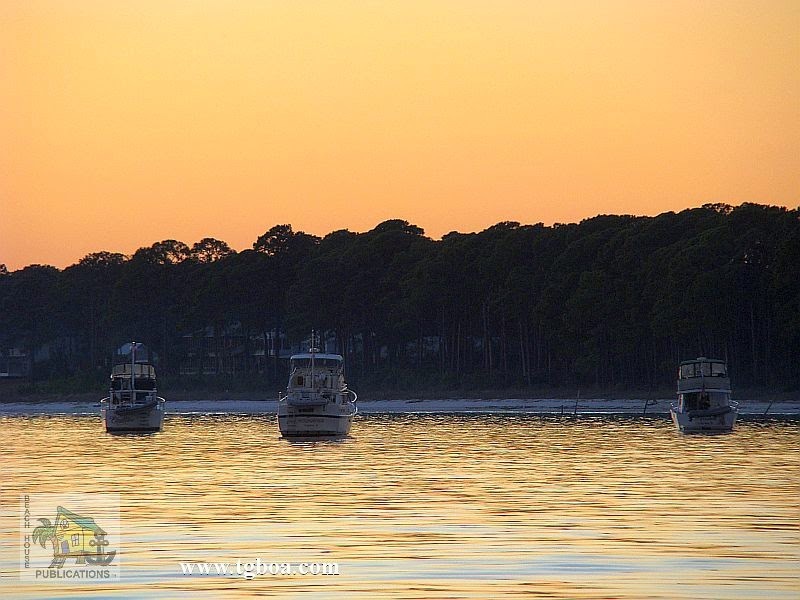 Many boaters claim there isn't much of anything to do in Carrabelle and as a result, pass it by. We find there is plenty to do and everything we might need is close by and within easy walking distance. The IGA grocery is practically across the street from the marina as is the Ace Hardware and Auto Parts. The Post Office is a little more than a block away and there are several shops in the immediate area. 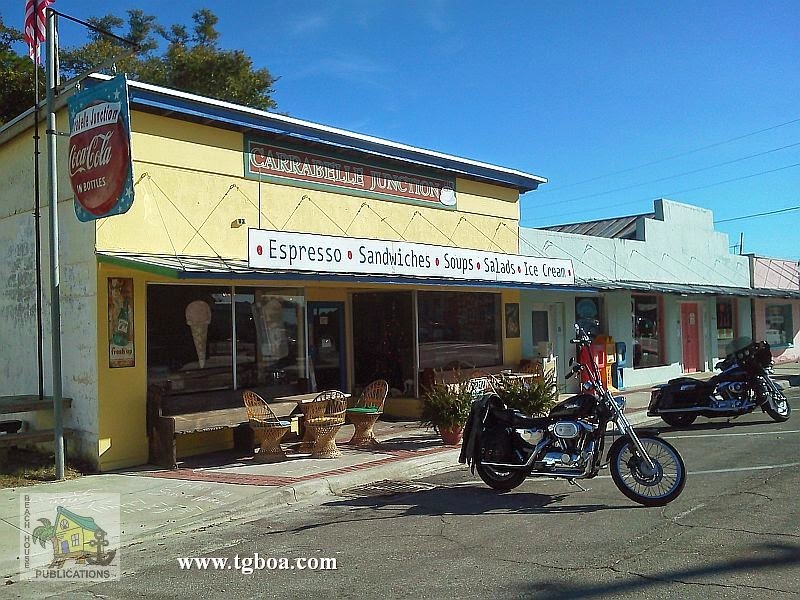 One we especially like, the ice cream shop, also sells coffee and sandwiches. Everyone's favorite restaurant is the Fisherman's Wife. They have their own shrimp boat, making the shrimp and seafood fresh and tasty. The portions are so large we have begun to share a meal instead of each getting our own. You still never come away hungry. There are a couple of local pubs and the town has a launch ramp, town dock and fishing pier. The deck facing the water at C-Quarters is a popular meeting place in the afternoon for locals and boaters alike, to enjoy cocktails and sunsets and tell some tall tales. What's not to like? It was another week before the next weather window presented itself. This one looked like an excellent opportunity for us to try to cross over to Steinhatchee. 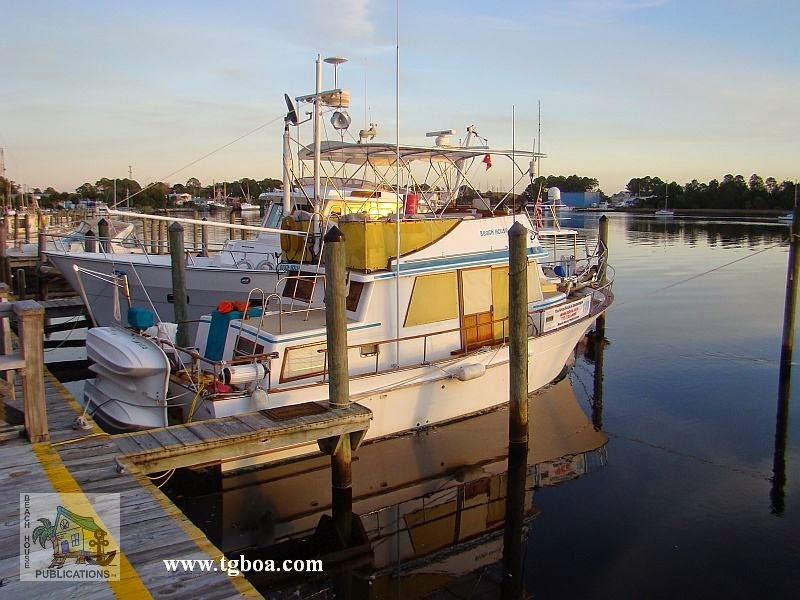 Once again, we set out on a Friday afternoon for Alligator Harbor with plans to leave early Saturday morning and arrive in Steinhatchee mid to late afternoon. Beach House returned to our previous anchorage just before the sun was setting. The evening was typical and the next day's course and schedule was discussed. Once again, we were amazed at just how little all of our planning could mean in the grand scheme of things. The winds were up as we finally went to bed for the evening, but by morning they had turned light and the harbor had little more than small wavelets. It was shaping up to be all we had hoped for. At 6:00 a.m., the generator was started so that the coffeepot could be fired up and breakfast prepared. A moment after starting, the generator abruptly shut itself down. Climbing down into the engine room, a surprise was waiting. Since it was a short run over from Carrabelle, the engine fluids were not checked until morning. 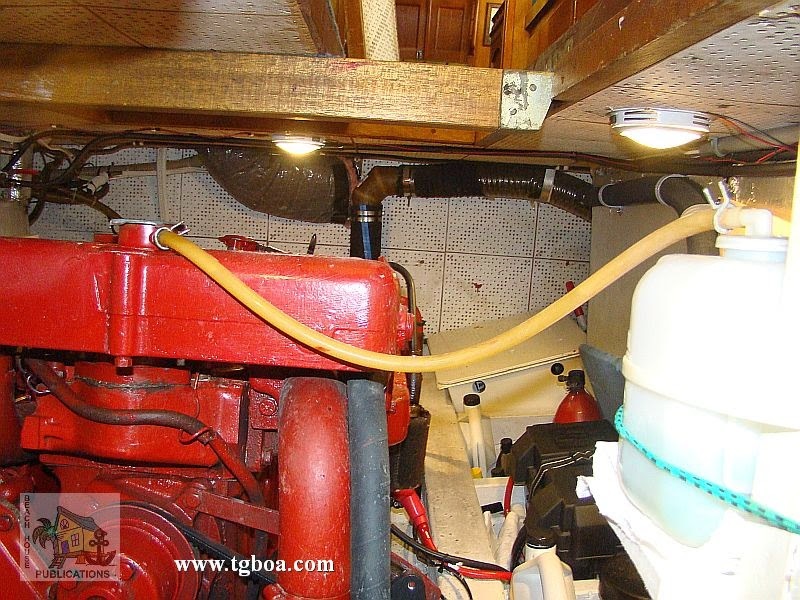 With the generator issue, once in the engine room, it was obvious that we also had an overheating problem with the main engine. There was coolant all over the front area of the engine where the coolant overflow tank had filled and then overflowed. This can only happen if the engine overheats. The engine temperature gauges had shown no signs of overheating and the engine alarms had not gone off. After a brief clean up and about an hour of troubleshooting, the generator was finally working. But the overheating issue had to be addressed. Checking the coolant level showed much of it had been expelled from the coolant tank, so additional water was added. While having coffee and breakfast, we let the engine run until it came up to temperature. Running it longer showed no signs of overheating, but we were not prepared to head off into the Gulf of Mexico with a potential engine problem. It was like someone was telling us that today would not be the day. By 8:00 a.m., a thick fog had settled in and visibility was becoming less and less. It became very apparent that today would not be our crossing day. 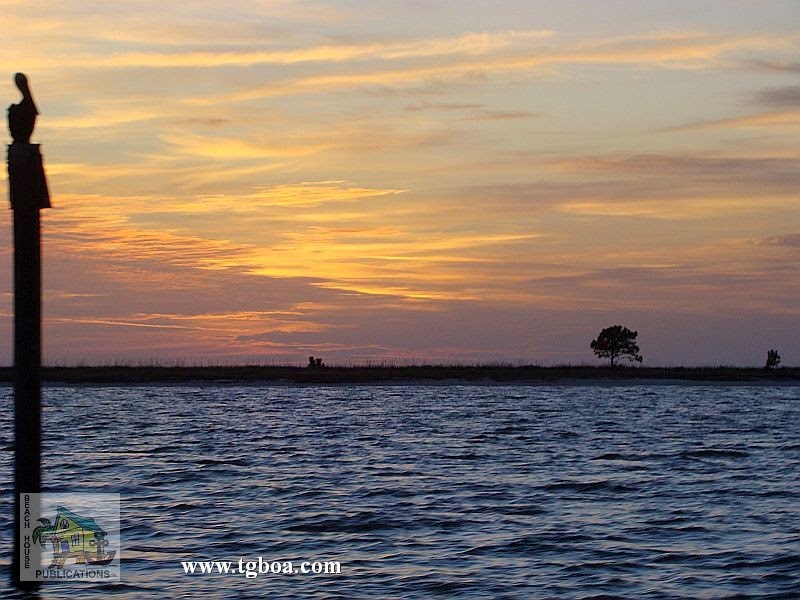 The anchor was raised and Beach House turned back toward Carrabelle. If the engine overheated on the way back, we knew BoatUS Towing was in Carrabelle and we have a membership with their towing service. 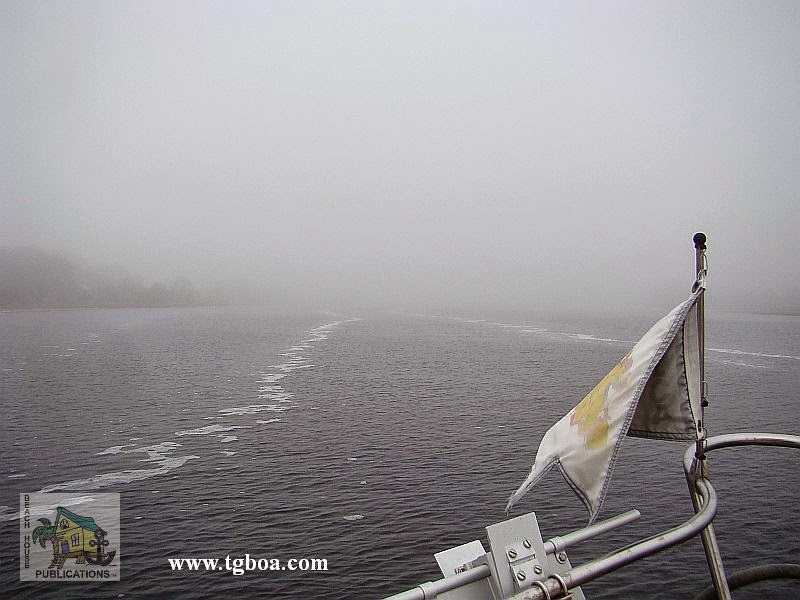 The fog began to thicken as we once again transited the sound and visibility was soon down to less than a quarter mile. Using radar and our previous tracks on our chartplotter, the trip back to Carrabelle was uneventful. Once we entered the approach channel to the river and harbor, we announced our presence and position on the VHF. Soon Beach House was once again secure in the same slip that had been assigned to us for the last week. The real conundrum was that during the entire trip back, the engine showed no signs of overheating and coolant levels remained the same. The next few days will be spent checking the entire fresh water system for possible issues. Then we'll try again when the next weather window rolls around. Visit of Facebook Page for lots of great photos, the latest boating news, navigation updates and just fun stuff.